We've returned to Taiohae again to stock up for our 500 mile crossing to the Tuamotus. We spent the last week in idyllic Anaho Bay. It is a protected bay on the north side of the island with a fabulous coral garden under water. There are few houses there, but no road in. You can hike over a steep hill to Hathieu for a store, restaurant and post office. At Anaho, we met up with Holly and Denis from Tango, who we last saw in Dana Point, California. On a "whim" 6 weeks ago, they decided to make the crossing. Although the winds are very calm, there are huge southerly swells pouring into Taiohae Bay. We arrived after dark last night and put out a stern anchor to keep the boat somewhat pointed into the swells. Landing at the quai is quite an experience, as the huge swells rise up and down several feet very quickly. Bill used the dinghy to tow a boat into the harbor, because their engine wasn't working, there was little breeze and darkness was approaching. We'll be here a few more days, then head for the Tuamotus. You need to time arrivals there to coincide with slack currents in the reef passes AND bright overhead sun. The tides are lunar driven, so Bill used the nautical almanac (finally) to calculate slack water before and after moon rise and moon set and floods and ebbs. Since the stars (or sun) is not aligned, we need to wait a few days to arrive at an auspicious (and safe) time. It's pleasant here, although warm. But it's comfortable at night and when the wind blows. The scenery is stunning and the villages and towns are neatly kept. People have nice midsized 4wd vehicles and some still get around by horse, sometimes at a gallop, smoking a cigarette! There are goats all over the place too. Tahuata a small island between Hiva Oa and Fatu Hiva. We spent several pleasant days there in the company of Secret Agent Man and Delos from Seattle. One day, we were towing the dinghy a short distance across smooth tho windy seas, and it flipped, soaking the outboard. Bill changed the oil a couple times and it ran OK for a while. But now it's fussy, so he cleaned the carburator. Now we're trying to figure out how to get a new carb in French Poly. We spent several days at Tahuata before heading down to Fatu Hiva. Fatu Hiva is lush with fantastic, or grotesque rock formations. All the islands are craggy and exotic. It has very limited transport to the other islands, ant therefore very little in the local store. So the locals are avid to trade fruit and crafts for just about anything you may have aboard. Internet is hard to come b y and Fatu Hiva has no internet service whatsoever. The local teens say they've been given email addresses but have no way to use them. Kids go to Hiva Oa for lycee (high school)..
A french friend lined up the local drum and dance troupe to perform. (will post pictures when possible). Most of the boats there were European, vs the mainly US and Canadians we run across elsewhere. We spent several days there before heading north to Nuku Hiva. We often meet up with our Seattle and other US friends, and make other friends easily, so we don't feel isolated. We spent a night in Controllers Bay nearby. It was fairly shallow and murky. At night it was a glwoing, sparkly phosphorescent soup. It was so cool. You could see the fish swimming around AND the sharks that feed on them! There were mostly small hammerheads, with a few regular sharks and rays mixed it. (Sharks after dark - wow) We didn't swim there. We are now in the largest town on Taiohae. It has wonderful stores and a good veggie market. The stores are much smaller than Sid's, but they have what we want. It doesn't rain much, so some islands don't have much water to spare. They get fuel deliveries by ship, and last week they ran out. So our friends were here waiting to get fuel. Usually, you transport it in jerrycans by dinghy back and forth to the boat. Even tho the bay is calm, there is a surge from the sea, so we're learning to work with that. Bill has also transported 120+gal of water from various towns that way over the last couple weeks. It's been interesting monitoring the weather across the south pacific. It's winter down here, so big storms are brewing south of New Zealand and off Chile that big generate swells that travel here. Also, weather systems develop south of the Tuamotus. The dynamics are somewhat different from the north pacific, so it's interesting to learn about that. Also deciphering the French text weather forecasts took some work. French radio weather is hard to receive and impossible to understand anyway. Our passage was uneventful, which is the way we like it, though both Kathy and I were a little uncomfortable from the heat and motion for much of the trip. We were joined for the passage by Steve Froebe, one of my former co-workers from Avtech. As with everyone who comes to visit, Steve also lugged a large bag of boat supplies down for us. We departed La Cruz Marina at 8:30 pm on Friday, April 9th after our last dinner ashore. By the time we took off, the afternoon sea breeze had died and we motored for about 5 hours before there was enough wind to sail. Our first night out of Puerto Vallarta we saw seven freighters. The next day, we saw one more and passed close to a fishing boat. On the 14th we saw another boat that we knew was nearby from listening to the position reports on the Pacific Puddle Jump marine radio net. On the 16th we saw the lights of a fishing boat way off in the distance. We didn't see another boat (or even a contrail) for two weeks until just before we arrived in Atuona. After the first few days, it starts to dawn on you that the Pacific Ocean is REALLY BIG and it just seems to get bigger and bigger every day. By the Friday we left, the weather forecasts had changed and it was looking like we would have good wind for the first few days. By the evening on April 12th we had pulled off a 178 mile day. The next day we were joined by a large pod of dolphins. We would continue to see dolphins on the crossing, but only every few days. On April 21st, we arrived at the Intertropical Convergence Zone (ITCZ) at about 5 degrees N. We motored along for about 19 hours in total before coming out the other side. It was very hot and humid crossing the ITCZ, with frequent squalls in and on both sides. Fortunately, none of these squalls packed much wind, though there was plenty of rain. On April 24th, we crossed the equator at about 0430 at 129d 42m west longitude. On April 25th we made our best 24 hour run of 197.6 NM. I was really hoping that we'd get to 200, but didn't quite make it. We'd been on a pace to make landfall on April 28th, but the wind started tapering off. On the evening of April 28th we spotted Hiva Oa and Motane Islands off in the distance. What a glorious site to finally see land. I speculated that we would have trouble moving about on an unmoving level surface while standing in a strange upright position with nothing to hang onto or lean against. By this time we were all greatly looking forward to some time on terra firma. As we approached the island, you could smell the earth and the vegetation. Some have said that land can really stink after weeks at sea, but this island was sweet smelling to me. 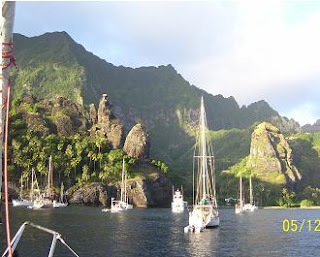 We arrived in Atuona on Hiva Oa in the Marquesas Islands on the morning of April 29. We motored in the last 10 miles or so as the wind had died to almost nothing. By the time I got ashore and made the 45 minute walk to town, the gendarmarie was closed for the day (at 11:00 am!? ), so we were stuck on the boat for an extra day. We finally got checked in the next day. Our passage was relatively fast. In total, it took 19 days and 16.5 hours. To us, it seemed like forever, but we really can't complain after talking to the couple on Lilith that took 55 days from Costa Rica! Crewman Steve was a joy to have aboard, always pitched in, and never seemed to have a bad day or even a bad moment. He left the boat a few days after we arrived and headed back to his family and work in Seattle. His presence will be missed. Before we even got out of Banderas Bay, we took a splash in the galley port. The igniter for the stove subsequently quit working. We flew the spinnaker for half a day before we discovered a large tear in it, so down it came. I hope to patch it up before we start the passage to the Tuamotus. By the ITCZ our brand new main halyard was showing a lot of chafe right above the shackle and I reluctantly cut off the splice I had just done right before we left. We tied it to the shackle with a bowline and it seemed to hold up after that. The autopilot quit working somewhere after the ITCZ, but we didn't really need it with the wind vane. In Atuona, I discovered that the vent fitting for the second fuel tank (which had been professionally installed in Seattle last summer) was not properly sealed, and saltwater was leaking right onto the brain box for the autopilot. Somehow, after a few days to dry out, the autopilot started working again though I should probably try to clean out the salt. The leak has been fixed. On the Pacific Puddle Jump radio net, we've been monitoring the progress of the boat "Sea Flyer" making the crossing who has had nothing but trouble. First, he had three lower shrouds and a chain plate fail (these hold up the mast). He was able to put together a jury rig to keep the mast from coming down. He then got going under power only to have the engine overheat and ended up having to swim under the boat to clean mussels out of the raw water intake. He rendezvoused with a freighter to take on extra fuel. It turned out the fuel was bad and had to change his fuel filters four times, before he gave up on the fuel. He then took a fuel drop from another freighter. He has since managed to repair his rig so that he can sail again, but the repair isn't nearly as strong as the original shrouds should have been. Like I said, our passage was uneventful! The passage was really fatiguing, from heat, constant and irregular motion, interrupted sleep, and just the effort required to move anywhere on the boat. Sometimes, I felt best at the wheel in a stiff breeze in a driving rainstorm... really! Otherwise, sometimes, there just didn't seem any point to getting out of bed, at least it was dry. Conditions that are fun sailing for a few days or hours, just lose their appeal after a while. Steve was super crew to have with us. He sure made things better for sure. What a great guy! I have a simple rule of boat maintenance. I try to accomplish one boat project every day and when I am done, I allow myself a beer or a drink. The beauty of this rule is that I get to define and choose the project, and if the project gets too big, I can break it up. Unfortunately, the first rule of boat maintenance fell apart when we got back to Bandaras Bay and pulled into the La Cruz marina on March 8. With our upcoming 2800 mile passage to the Marquesas only a month away, there was much to do to get the boat prepared. As a result, we spend the majority of our time in the area working on the boat. The 9th was my birthday so we invited the crews from Capaz, Totem and Soirce as well as Greg of the Coast Guard Couple over for a party. Kathy served up a most excellent Paella and a good time was had by all. We started two major projects while in La Cruz. One was to replace the AC powered refrigeration with a more energy efficient DC powered compressor. The other project was to reconfigure the bimini and install two 85 watt solar panels. I had the refrigeration compressor waiting in La Cruz when we arrived and got started in earnest. I did the mechanical and electrical installation and hired Don May of Fresco marine to do the plumbing and to charge the system. Don is reasonably priced and is great to work with, so if you need work done in PV, he is your guy. On March 12th Kathi's former co-worker and friend flew into Puerto Vallarta for a stay split between the Mayan Palace and the Krystal. We joined her for dinner a few times during her stay and made a trip down into the old town where we saw the Mexican military band perform while perched on a restaurant balcony overlooking the square. We probably didn't need that pitcher of sangria after the first round of drinks, but the ribs were excellent. We had signed up to do the Bandaras Bay Regatta and moved to Paradise Village Marina in Nuevo Vallarta on March 14. The next day, Lynn McNulty and (Doctor of Chocolate) Kristi Leissle arrived. Lynn stayed with Ron Anderson while Kristi stayed on the boat with us. Unfortunately, due to the backlog of projects, we were unable to sail in the regatta, but Kristi had found a ride on another boat so we got to live vicariously through her. We really enjoyed having Kristi aboard, but too soon she had to fly home so that she could fly back to see family in New York. We continued to chip away at boat projects. Once the new bimini frame was fabricated, I installed the solar panels. Once this was done, we had to have the bimini re-cut and some modifications done to some of the other canvas work. For this work, we used Camillia Fox. Though not cheap, her work was excellent and it was done when she said it would be. This was a rare occurrence for us in Mexico. Our scheduled departure was for April 5th and on April 3rd, my former co-worker Steve Froebe arrived. As it turned out, the forecast was calling for light winds for the first 300-400 miles and we really weren't ready to leave, so we worked feverishly to get the boat ready to go. Steve pitched right in and was a joy to have aboard. The staff at the Paradise Village marina gave my a free boat shuttle ride across to the port captain's office and I checked us out of Mexico on April 8. For immigration, they actually sent two agents over from the airport to the port captain's office. We now had 48 hours to get out of Dodge. On Friday afternoon we finally got underway with a final stop in La Cruz to top off the diesel. While we were there, we had our last shore side meal at the marina. At 8:30 pm, we were finally on our way to the Marquesas.